A Caesarean Birth is a major surgical operation in which the baby is born through an incision in the abdominal wall and the lowest part of the uterus. For the vast majoriity of women, it is performed under a spinal or epidural anaesthetic, so that the woman can be awake. In a small number of cases, it is necessary to use a general anaesthetic which will mean that the woman is asleep during the birth. There are two types of caesarean births, elective caesareans occur before labour begins and emergency caesareans which occur during labour as a result of a complication. Rates of Caesarean Birth are rising around the world, with the current Australian figure at 32.3% in 2011. In 2011, 28.8% of women having a second or subsequent baby and who gave birth in Australia, had a history of previous caesarean section. This proportion ranged from 26.1% in the Australian Capital Territory to 30.3% in South Australia. Of those women who had a history of previous caesarean section (excluding Western Australia), 23.3% of women had had the procedure more than once. This sounds as if the mother has chosen to have a caesarean section, and in some cases this is true. 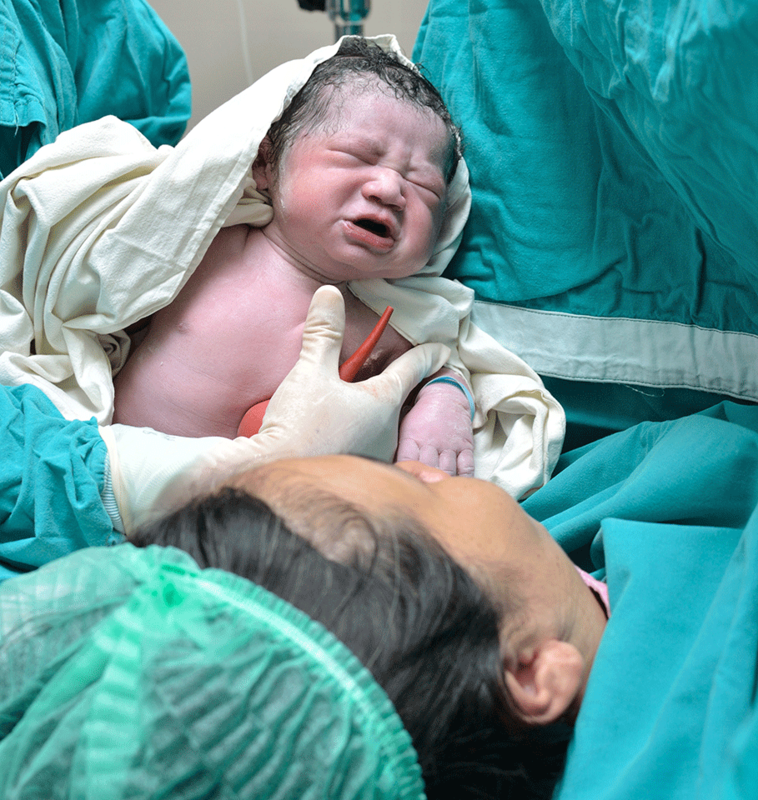 Elective caesareans also include women who have experienced a complication during the pregnancy which means that attempting a vaginal birth is not advisable. An emergency caesarean section occurs once labour has begun and is usually recommended due to a complication arising for you or the baby, which requiries the baby’s immediate birth. This is the most commonly used anaesthesia unless there is an emergency requiring urgent action. The mother will be awake during the operation and can see and hold her baby straight away, unless the baby’s condition requires urgent medical treatment. With an epidural, suction noises and changing internal pressures and tugging (but no pain) may be felt as the baby emerges. This is similar to an epidural, but faster acting and of shorter duration. Spinals are used in emergency situations as an alternative to an epidural. A spinal block uses 1/10th the amount of anaesthetic used in an epidural. A general anaesthetic is used if an emergency develops requiring an immediate operation. It is faster to administer than the spine based anaesthetic blocks. The mother will be completely unconscious. What is involved in a Caesarean Birth? Have you had complications with past surgeries? What have you had to eat or drink in the previous 24 hours? You will be asked to remove any jewellery such as rings, chains and ear-rings. If you are wearing nail polish this might be removed for you by the nurse. A cannula is inserted into your non-dominant hand in order to set up an intravenous drip line once you are in theatre. The nurse may take a few tubes of blood in order to type match them ahead of surgery. You will be asked to change out of your clothes and into a hospital gown and you will be asked to put a hair net cap to cover your hair. Now that you are in your party gear it’s time to go to the theatre suite. You could choose to walk if you are not anaesthetised or in labour, or you might be offered a wheelchair or wheeled to theatre on a bed. An anaesthetist works with you to site an epidural or spinal block whilst you are supported by the nursing staff. The anaesthetist will probably be the person you interact with most during the birth. An intravenous drip line will be set up into the back of your hand. A catheter is passed into your bladder to keep it empty. Your pubic hair is shaved and the area is wiped to create a sterile area. A blood pressure cuff is placed around your upper arm to give a continuous reading. The area will be surrounded with sterile drapes, and a drape will be erected as a screen so the operating area is out of your line of sight. Your partner is now invited back in to join you – you are all set for the birth. Some time is normally given to ensure that the anaesthetic is completely effective. When anaesthesia is complete, the obstetrician will begin the surgery. An incision is made through the lower abdominal wall, usually on the ‘bikini line’ just above pubic bone. The bladder is lifted back, and the uterus is opened. The amniotic fluid is sucked from around the baby after the membranes have been opened. The baby is lifted from inside the uterus. If the baby has travelled deep into the pelvis, forceps are sometimes used to bring out the baby’s head. If you want to watch the birth, the theatre nurse will drop the curtain. Make sure the midwife knows your preferences beforehand. As the baby is being born, an injection of oxytocin is given into one of your thighs, to help the placenta to separate. The placenta is then lifted out, and the uterus and abdominal wounds are stitched. It may be possible to have your baby placed immediately skin-to-skin on your chest and be covered by a warm towel and sometimes a bit of bubble wrap. Make sure the midwife knows your preference beforehand. If the baby is not placed skin-to-skin with you, but the birth has been uncomplicated, you may be able to hold your baby wrapped in blankets Your baby will then be taken to the Resuscitaire, examined, wipped, tagged and swaddled before being taken to the maternity ward by your partner. Following the surgery you will be taken to the recovery area until your vital signs stabilise. If you have had your baby skin-to-skin on your chest, you may be able to keep the baby with you and breastfeed in the recovery room. Make sure the midwife knows your preference beforehand. If your partner takes the baby to the maternity ward, they can give the baby skin-to-skin contact once they have settled into the ward. Partners do this by removing their shirt and the baby’s blankets and sliding back into a chair with the baby on their chest and a blanket over them both. Your partner’s body will keep the baby warm and the skin-to-skin contact will help maintain the baby’s oxytocin levels and promote reflexive breastfeeding behaviours. Yes, the baby will probably try to find its first meal from your partner's chest! Once you have stabilised in recovery you will be wheeled on the bed to the maternity ward. It can often be a couple of hours before you are reunited with your partner and baby for kisses and cuddles. The length of time between the first incision and the baby's birth in an emergency caesarean. The length of time between the first incision and the baby's birth in an 'elective' caesarean. The length of time between the first incision and moving out of theatre to the recovery area.